Pope Francis gave parents the go ahead to smack children - if their dignity is preserved. His remarks during his weekly general audience in Rome have provoked social media outcry with many accusing the Argentinian pontiff of supporting violence. 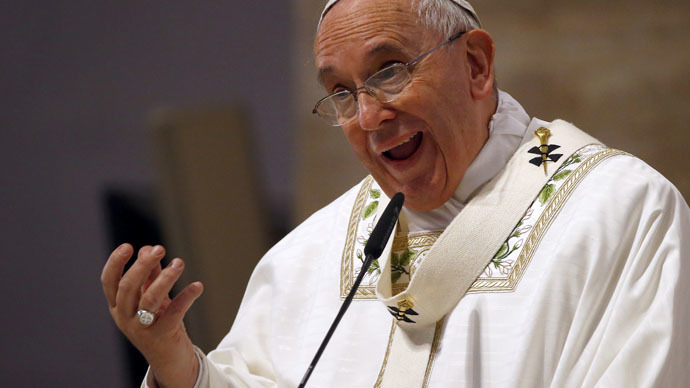 Pope Francis devoted his latest homily to the role of fathers in the family. Up to 7,000 people gathered in the Pope Paul VI Hall on Wednesday to hear it. "One time, I heard a father in a meeting with married couples say `I sometimes have to smack my children a bit, but never in the face so as to not humiliate them,'" the pope recalled. "How beautiful!" the pontiff noted. "He knows the sense of dignity! He has to punish them but does it justly and moves on," he added. Pope Francis says that spanking is okay under certain conditions although he did not clarify whether it should be considered foreplay. The endorsement of parental punishment was slammed by children's rights groups. “It is disappointing that anyone with that sort of influence would make such a comment,” the coordinator of the Global Alliance to End Corporal Punishment of Children, Peter Newell, said. According to the founder of the National Association for People Abused in Childhood, Peter Saunders, the pope's remarks were misplaced. “I think that is a very misguided thing to have said and I’m surprised he said it, although he does come up with some howlers sometimes,” Saunders, who was abused for over five years by two Catholic priests as a child in London, told the Telegraph. In December, Saunders was appointed by Pope Francis to his new Vatican commission on protecting children from abusive priests. “It is a most unhelpful remark to have made and I will tell him that,” he added. @Pontifex I have 2 children w/spec needs. All spanking taught them was that someone who loves them, hit them. Where's the dignity in that? The Rev. Thomas Rosica, who collaborates with the Vatican press office, said the pope wasn't speaking in favor of violence against children, however. "Who has not disciplined their child or been disciplined by parents when we are growing up?" Rosica told AP in an email. "Simply watch Pope Francis when he is with children and let the images and gestures speak for themselves!" Last month the pontiff offended large Catholic families by saying that there was no need to breed 'like rabbits'. He cautioned for 'responsible parenthood', saying three children was 'about right'. The Catholic Church's position on corporal punishment came under fire last year during a grilling by a UN human rights committee monitoring implementation of the UN treaty on children's rights. In its final report, the committee members recommended that the Holy See amend its own laws to specifically prohibit corporal punishment of children, including within the family, and to find ways to step up the ban in Catholic schools and institutions worldwide. The recommendations were triggered by reports of widespread physical abuse and use of corporal punishment in Catholic-run schools and institutions, particularly in Ireland. The Vatican had insisted it never promoted corporal punishment, saying it had no way to enforce any kind of ban on its use in Catholic schools, over which it has no jurisdiction. It noted that according to church teaching, parents "should be able to rectify their child's inappropriate action by imposing certain reasonable consequences for such behavior, taking into consideration the child's ability to understand the same as corrective." The Holy See isn't the only signatory to the convention that has been questioned on the issue. Britain received a similar recommendation to cancel its law allowing parents to spank their kids when it came before the UN committee in 2002. Up to 39 countries, from Germany to South Sudan, forbid corporal punishment in all forms and settings. This includes at home, where most violence usually occurs. In 19 US states, it's still legal for personnel in schools to practice ‘paddling’, while parents can legally strike their child as long as the force is ‘reasonable’.